Update: the DexCom STS was approved by the FDA on March 27, 2006 and is now available for purchase. Patients will undergo a one-hour training session to learn how to use the injection and monitoring system. They can then begin using the pump, monitor and insulin-injection systems in diabetes care centers and at home. Patients would then buy new sensors directly from Dexcom. Also visit insulinfactor.com to learn more about the system from Matt Vogel, a user who wrote about his first few weeks on the device. Also, significant differences in accuracy can be seen in one individual when the Dexcom and another continuous monitor are worn at the same time. DexCom, headquartered in San Diego, California, is focused on developing technology for the continuous monitoring of glucose in people with diabetes. They are committed to developing technologies and products that improve the lives of people with diabetes. DexCom is developing two platforms of Continuous Glucose Monitoring, a long term(LTS™) and a short term(STS™) system. Both DexCom Continuous Glucose Monitoring Systems include a sensor - a small insertable or implantable device that continuously measures glucose levels in subcutaneous tissue just under the skin - and a small external receiver to which the sensor transmits glucose levels at specified intervals. With the push of a button, the receiver displays the patient's current blood glucose value, as well as one-hour, three-hour and nine-hour trends. The receiver also sounds an alert when an inappropriately high or low glucose excursion is detected. The DexCom™ STS™ Continuous Glucose Monitoring System is a patient insertable short-term sensor that is inserted via the DexCom™ STS™ Applicator by the user or clinician just under the skin where it is held in place by an adhesive to the skin. 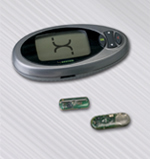 Once inserted the user would wear the DexCom™ STS™ sensor for up to three days before being replaced. After three days, the patient simply removes the sensor from the skin and discards it. A new sensor can then be used with the same receiver. Two scientific abstracts showing short-term data from DexCom human clinical trials were accepted into the poster sessions at the 2005 American Diabetes Association annual meeting. The first was a Randomized Controlled Study of a Transcutaneous Real-Time Continuous Sensor. The study demonstrated statistically significant improvements in glycemic profiles with the use of the short-term system with no guidance or therapeutic adjustments from physicians. The second was the results from an unblinded feasibility study of a short-term continuous glucose sensor in subjects with type 1 diabetes which summarized accuracy and effectiveness of the short-term sensor. DexCom filed an application for premarket approval, or PMA, with the Food and Drug Administration, or FDA, for the short-term system in March 2005. Premarket approval is the FDA process of scientific and regulatory review to evaluate the safety and efficacy of medical devices. The PMA was accepted as filed and granted expedited review status in May 2005. The DexCom™ Long Term Sensor is implanted under the skin in the abdomen via a local anesthetic short outpatient procedure by a physician and is designed to function for up to one year. At the end of its life, the sensor can be removed by a physician in a short procedure, and another sensor implanted. DexCom has also generated encouraging human clinical data with its first generation long-term system. Two scientific abstracts showing long-term data from DexCom human clinical trials were accepted for oral presentation at the 2002 American Diabetes Association annual meeting. The first abstract summarizes the accuracy data of the DexCom sensor over several months when compared to both conventional glucose meters and standard laboratory references. The second abstract demonstrated potential utility in detecting glucose excursions. Results from a clinical feasibility study with the first generation long term DexCom system were presented at the 2003 American Diabetes Association annual meeting and were published in May 2004 Diabetes Care. This study provided clinical outcome data suggesting meaningful improvement in the glucose profiles in patients with diabetes using the DexCom continuous glucose monitoring system to help manage their disease. DexCom recently announced that the FCC has granted its request for a waiver from certain Medical Implant Communications Service (MICS) rules concerning radio frequency transmissions of its short-term (STS™) and long-term continuous glucose monitoring systems. The waiver provides clearance for the DexCom continuous glucose monitoring systems to wirelessly transmit data to patients in the MICS band. DexCom had previously cited the need to obtain this waiver from the FCC in its filings with the Securities and Exchange Commission. In granting the waiver, the FCC stated that: "The significant medical value of these devices as presently constituted for current diabetic patients is a compelling factor in our consideration. The substantial public interest in making a blood glucose monitoring system available is uncontested."